NEW HAVEN, Conn. (AP) -- Lindsay Davenport began Saturday seeking to defend her Pilot Pen title. She ended it hoping she'll be able to play in the U.S. Open. Davenport retired from the Pilot Pen championship with an injured right shoulder, allowing Justine Henin-Hardenne to take the title in the final hard-court tuneup before the year's last Grand Slam tournament, which starts Monday. In the men's final, second-seeded Nikolay Davydenko defeated Agustin Calleri, 6-4, 6-3, for his third title this season. At No. 7 in the world, Davydenko is the highest-ranked Russian on tour and the only one of his countrymen to win this year. Both Davenport and Henin-Hardenne entered New Haven after long layoffs because of injuries and it was the 24-year-old Belgian that picked up the momentum heading into the U.S Open. She did not lose a set in New Haven in reaching her eighth final in 12 events this season. Davenport got the match experience she was looking for	--	she played five in five days	-- but has to contend with pain in her serving shoulder just before the Open. She's hopeful she'll be able to play. Henin-Hardenne needed only 22 minutes to win the first set 6-0. Between sets Davenport called for a trainer and took a medical timeout. When she returned, Davenport lost her serve in the first game of the second set and was in obvious pain. She met Henin-Hardenne at the net and shook hands, and the longtime favorite drew an ovation from the crowd. The second-seeded Henin-Hardenne kept her intensity throughout the week, posting straight-set wins over Anabel Medina Garrigues, Mara Santangelo and Svetlana Kuznetsova, the 2004 U.S. Open winner. Davenport and Henin-Hardenne have a combined 79 singles titles and eight Grand Slam wins heading into next week's U.S. Open, an event they have both won. Henin-Hardenne, the second-seeded player and wild-card entry, drew a first-round bye, but Davenport had to work her way to the title match from the first round. She won all four matches in straight sets, including against top-ranked Amelie Mauresmo. ``I'm happy I was able to perform here. I feel absolutely horrible for the tournament and all the fans,'' Davenport said. She lasted a total of 26 minutes against Henin-Hardenne. Davenport won five points in the first game, then won only seven points over the next six games. Davenport said she knew after the first three games of the match that she likely wouldn't last. 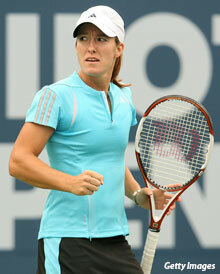 Henin-Hardenne leads the series between the two 6-5. She has now won five singles title this season, which she called the best of her career. She took time off after Wimbledon to rest her right knee, hampered by chronic pain due to cartilage problems. It's the first time since 2003 she's been in all four Grand Slam events. And most importantly, she said, she's having fun.